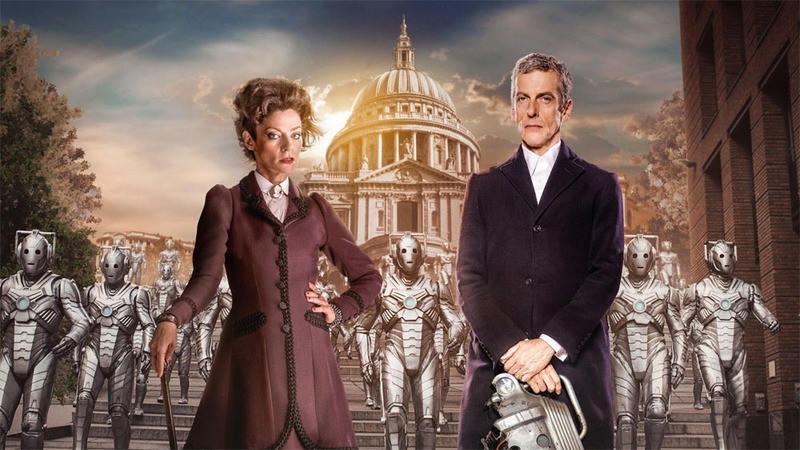 Television Review: Doctor Who Series 8 – My Verdict on Peter Capaldi’s first year! Doesn’t time fly? It seems incredible that, after all the waiting and anticipation, Peter Capaldi’s first year at the healm of the TARDIS has come to an end! It’s been interesting to see a new era of Doctor Who begin and with such a fine actor in the title role. 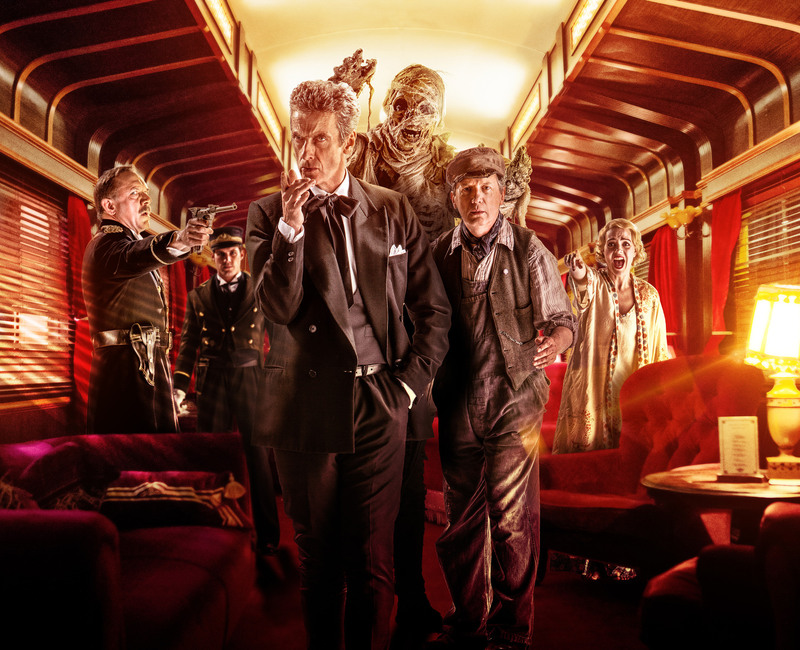 After reviewing episode one in early August after the world premiere (Deep Breath premiere review), it seemed appropriate to look back at series 8 as a whole. So, after rewatching all 12 episodes again, here are my thoughts and ratings for each one. Overall I like this episode and enjoy it more each time although I still think it’s too long and there are parts I don’t like. Clara’s initial reaction to him irritates me – she has after all seen every Doctor and understands what regeneration means, so her attitude feels a bit odd. The most frustrating aspect for me remains the episode’s use of elements from The Girl In The Fireplace. The direct references to this, although amusing, didn’t make it less annoying that this was a partly old idea being reused. I do however think it’s a solid start for Peter’s Doctor, with some great scenes and lines and his relationship with Clara grows over the story. The introduction of Missy in “heaven” is intriguing (love her implying her Scottish voice is because of the new Doctor), although after a while I found these cutaways rather annoying. There’s teasing and then there’s being irritating, when the same scene is effectively repeated again and again. Lastly, I loved the end – having Matt’s Doctor pass the baton on to Peter’s in such a lovely, moving way was very very nice indeed. This was my least favourite story of the year. I wasn’t overly fussed about it on first viewing and although enjoyable, I haven’t changed my mind after watching again. 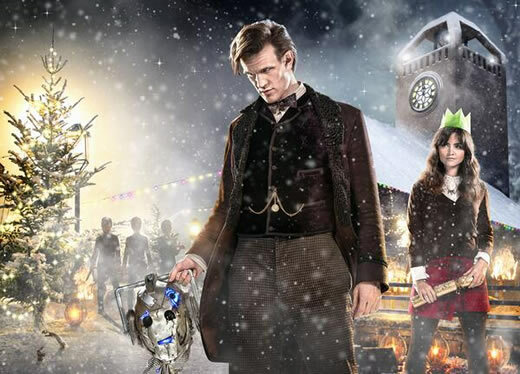 It starts well with the Doctor again facing a Dalek, I liked the introduction of Danny Pink and the awkward conversation with Clara and it was interesting to see the colder aspects of the Doctor’s personality so soon after number 11. Plus it contains one of my favourite lines: “I’m his carer. Yes she cares so I don’t have to.” However, for me personally, there were too many echoes of other episodes – the chained up Dalek from series 1, sliding in to the slimy depths of a creature from The Beast Below and above all the miniaturisation element which was done to death throughout series 6. It made the story feel a bit too recycled and dull for me. Clearly the most silly episode of series 8, which almost feels like a pantomime on screen, this is another ridiculous tale from Mark Gatiss. It is a bit weak and childish, but on the other hand, episodes like this help remind me that Doctor Who is a children’s/ family show and so sometimes I think it needs an episode this mad. 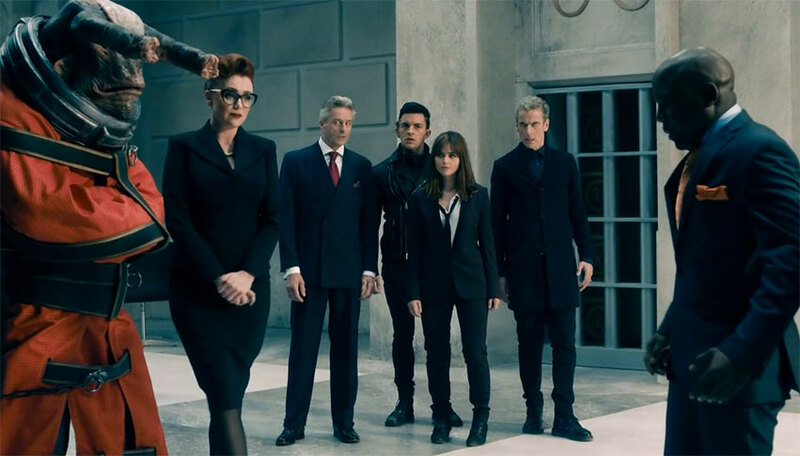 Identified by most as the weakest of the year, I prefer this to Into The Dalek simply because it is light-hearted fun and is less of a recycled episode than episode 2 (although the gold circuits did remind me a bit of The Fires of Pompeii…) and it was nice to see Peter Capaldi able to have some fun in the role. We’ve encountered famous historical figures in Doctor Who before but I liked the idea of someone we all think is a fictional legend actually being real. You never know, maybe like Robin Hood the Doctor is real and out there after all! A superb episode, which was just as wonderful on second viewing. I’ve felt Steven Moffat’s writing has been way below par for a while and yet this episode finally has him back to the standard of years past. He’s given us creepy before (e.g. Blink, shadows that kill) and Listen is up there with the best of New Who. As RTD’s Midnight proved so brilliantly, some of the creepiest stories as those which leave work to the imagination and aren’t fully explained. As well as being a dark and creepy story about the creature under the bed and our fear of being alone in the dark, Listen also weaves a beautifully poetic tale of helping people gain strength from fear. Jenna Coleman is excellent here, showing her character’s kind heart with Rupert and then the young Doctor, which is a very clever plot twist – the moment she grabs his foot is fantastic and I loved that the Doctor’s inspiring words to Rupert actually came from Clara. Plus the reference to the barn from the 50th was a nice addition. The date scenes are a bit annoying, but overall I loved the balance of the episode. It also raised the question still unanswered – if Orson is related to Clara, then is she pregnant at the end of the series? For me this is an average episode, mainly because I suspected the Doctor was the Architect all along and the fact that I find Keeley Hawes’s character a bit weak and two dimensional. I do like the characters played by Jonathan Bailey and Pippa Bennett-Warner and there are some great lines in here (love the Doctor’s reasons for why Clara needs high shoes on and comparing himself to a magician! ), plus it’s yet another fab outfit for Jenna Coleman. However I just find the plot a bit dull, predictable (two mates needing reuniting was also done recently in Hide) and at the end of it I can’t help wondering what the point was. This is an enjoyable episode, although I can see why some may think otherwise. It’s the first time we see Peter Capaldi’s Doctor attempting to fit in to the human world and his turn as the caretaker makes me smile. 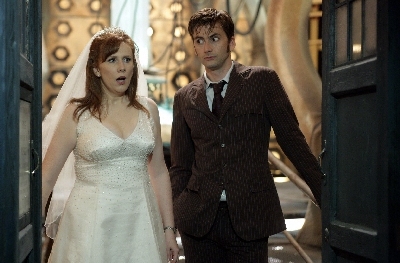 Matt’s bumbling non-human approach in The Lodger frustrated me following on from the 10th Doctor, who was clearly pretty in tune with human life and customs, making 11’s lack of them unbelievable for me. 12’s slightly clueless, alien attitude on the other hand works – he’s been slightly less human as 11 and we’ve already adjusted to Peter’s Doctor’s personality so his behaviour makes perfect sense. I love his scenes with Courtney – honest despite what he’s saying being bonkers and his assumption Clara’s new man is a bow tie-wearing geek! Samuel Anderson does well here in my opinion. Unlike Mickey and Rory, he is not going to run blindly after Clara and his attitude towards learning her secret is far more mature. Despite knowing now where the series is going in the finale, I still find the Doctor’s vehement harshness to Danny’s soldier past a bit jarring as he hasn’t been this harsh to other military people (and has at times encouraged military service e.g. Planet of the Dead), so this feels engineered simply to fit the finale. Oh and geeky location spot – I can’t watch this without thinking of Sherlock’s His Last Vow, which clearly used the same location for the drug den! Although it’s received mixed views online I quite like this episode. Leaving aside the mad idea that a newborn would be able to lay another egg immediately, I tend to like the slightly claustrophobic stories where just a small number of characters are stuck together in difficult circumstances. I still like Courtney and enjoy her banter with the Doctor. Plus the Doctor leaving them to make the decision was something new and quite shocking, emphasising more and more how different he is from numbers 10 or 11, who I find it hard to picture taking the same action. Jenna Coleman is again fantastic here and her final angry confrontation with the Doctor is very believable. 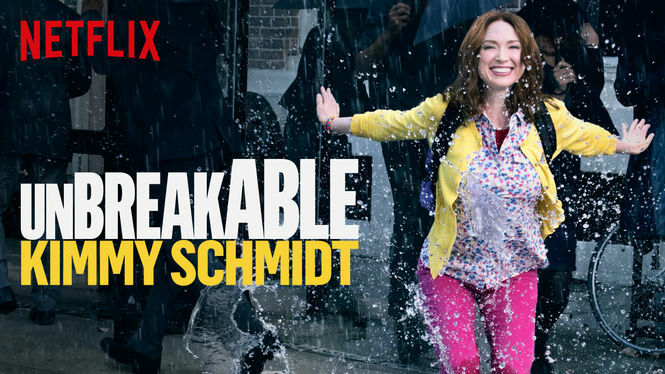 Despite its story flaws, it’s still quite enjoyable for me. This is definitely my favourite episode of the series. The story is interesting, scary, wonderfully paced and filled with great characters and dialogue (including some great nods to the past, e.g. the call to the TARDIS about something on the Orient Express and Are You My Mummy? for a start). 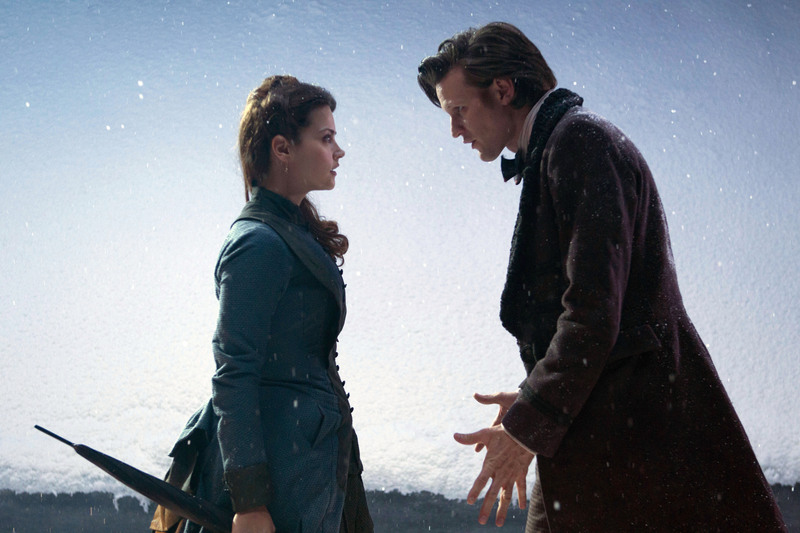 It also moves the Clara/Doctor relationship on, as we see Clara struggle with the tougher aspects of travelling with him, especially this new version, who appears to be far colder and at times heartless than the last one, before realising she can’t give it up. 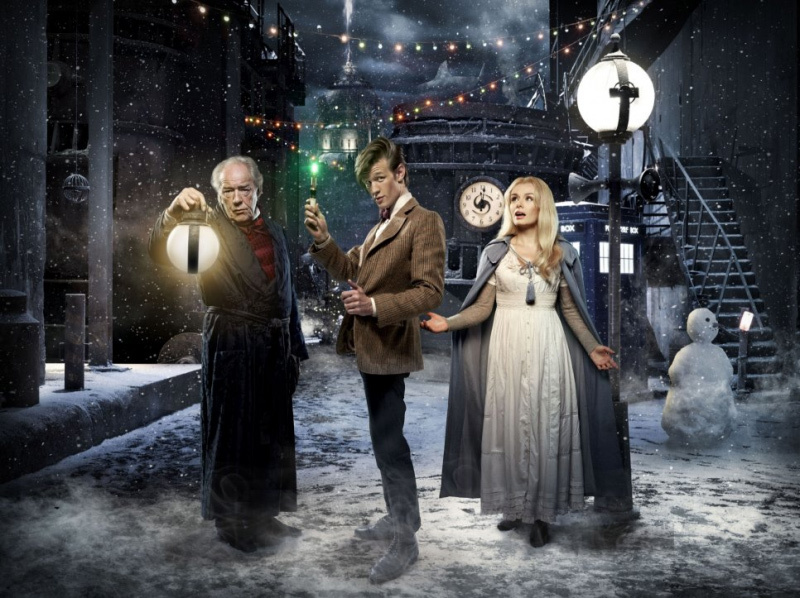 The central themes of the series that come together at the finale are also present (soldiers and the cost of war, whether the Doctor is a good man). We also see Clara developing more of the Doctor’s traits as she lies to both Maisie and Danny. As Frank Skinner’s Perkins notes, travelling in the TARDIS can change a man, something he can’t sign up for but something Clara can’t give up, despite the hard decisions it may bring. Definitely one of the best of New Who. Another brilliant episode. The concept was exciting and creepy, with The Boneless being a fab monster. We’ve had the enemy under the bed and here’s the one in the walls! I also loved the hilarity of seeing the mini TARDIS, which despite the tension of the episode brought a dash of humour and silliness to some scenes (Peter’s little dance when he has moved the TARDIS is fab). Plus the Doctor gets to do his best hero speech so far. I know some people have been frustrated that this series has had the companion taking centre stage rather than the Doctor, which again happens here, but I quite like it (I admit my fondness for Clara over Amy perhaps helps me form this view). The series has slowly, brick by brick, shown how being with the Doctor changes you and here, as the Doctor sees how good Clara is at being him, we see him try and make her realise that being the Doctor is not necessarily a good thing as he continues to struggle to understand if he is a good man or not. I enjoyed this episode quite a lot. 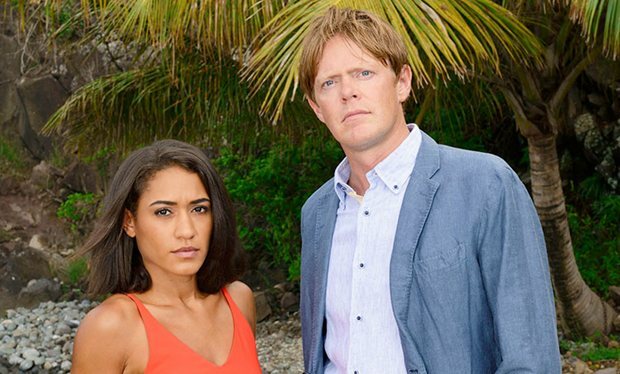 The story is something a bit different and it’s nice to see more of Danny, who we have still not really got to know well (which seems odd in light of the finale). Visually I loved seeing this version of woodland London and it was nice to not really know the reason for the invasion immediately. Yes, the idea is a bit bonkers and the end with the daughter suddenly reappearing was a bit too cheesy, but it was fun and allowed us to see more of Clara & Danny together. I still find Danny’s attitude refreshingly mature – all he wants is honesty, something Clara has been using less of as the series has gone on. I also really enjoyed the scene in which Clara tells the Doctor to leave. By this point I think the relationship between number 12 and Clara has found its stride and is something quite different from recent Doctor/companion relationships. So we reach the finale and I thought this first part was pretty darn good. 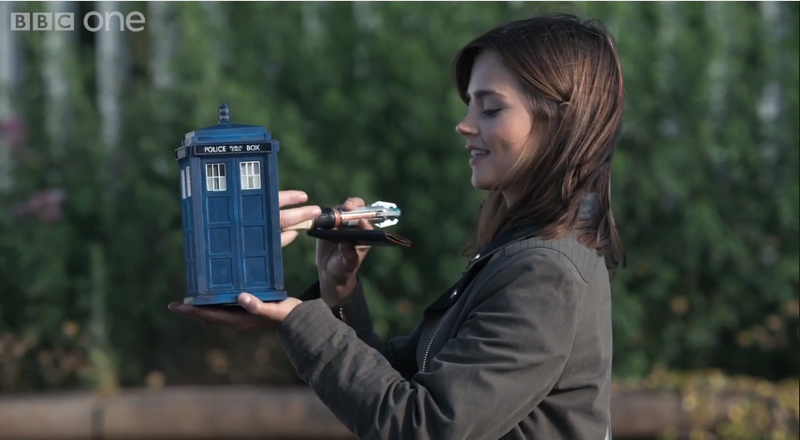 The opening sequence with Clara and Danny on the phone was very poignant. I could see it coming a mile off, but I still felt sad for Clara, as I imagined how awful that must be. The episode then seemed to take an unexpected turn at the volcano. Teasers had possibly suggested Clara was a baddie, but this scene was much more interesting and Jenna and Peter were excellent. 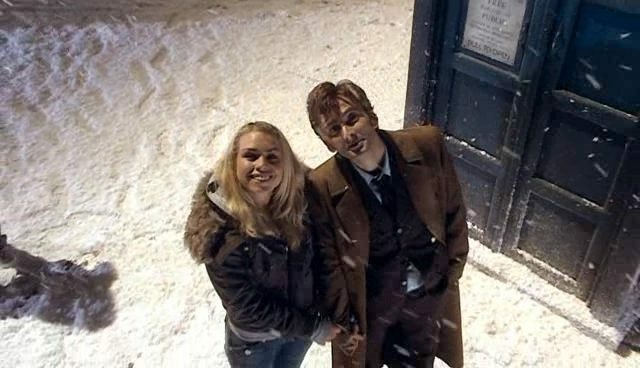 It’s also lovely to see the Doctor opening up and acknowledging how much he cares for her. 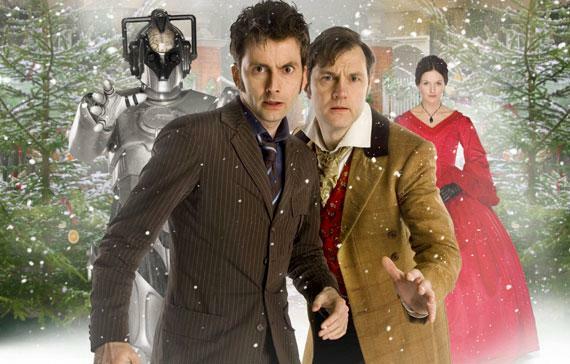 I do wish the Cybermen inclusion had been kept under wraps. I knew but had it not been in the teaser I imagine many would not and the teardrop logo, doors and windows were a clever hint. Samuel Anderson tackled Danny’s confusion at his new state well, making me feel incredibly sorry for him. Then of course there is Missy, who is wonderfully cruel and funny. 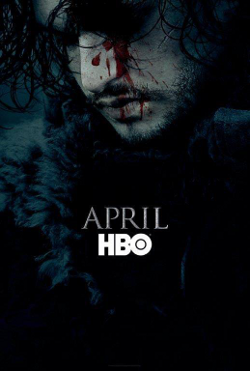 I was not annoyed by the final reveal (perhaps because I’m not really a classic Who fan) and was left feeling very excited for the finale. 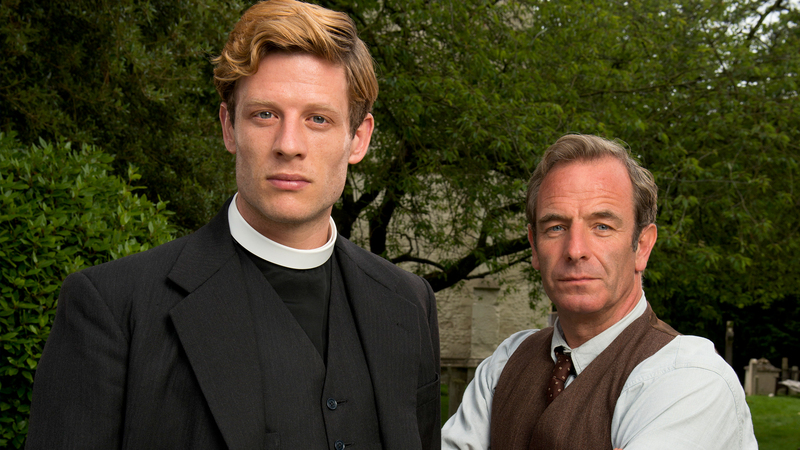 My biggest problem with the finale was, for me, it didn’t live up to the strong start of Dark Water. There were too many little things that annoyed me, such as why does Danny take Clara to a graveyard of all places? 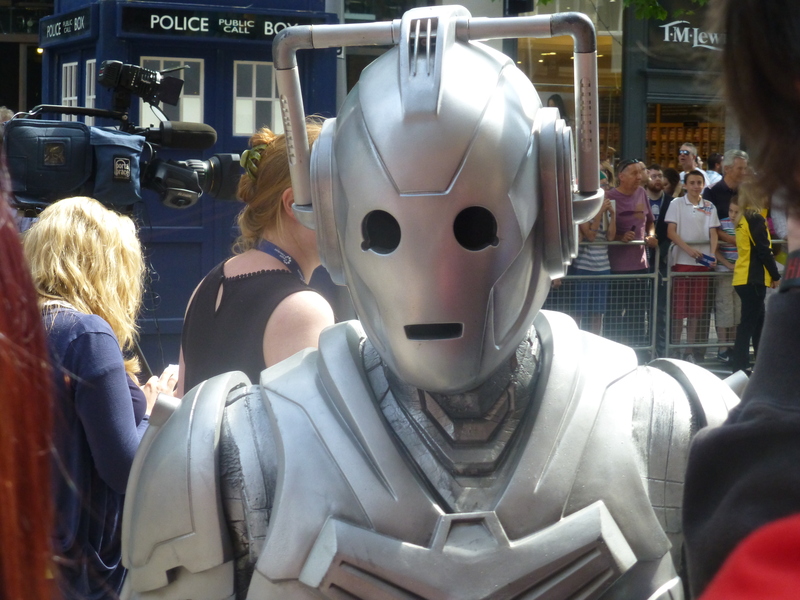 Why doesn’t anyone recognise the Cybermen from the battle of Canary Wharf? Why get on a plane when the sky is filled with dodgy clouds? Plus there isn’t a shopping centre outside St Paul’s (yes I know that’s picky!). There is however lots to enjoy. Osgood is a great character – fun and intelligent. I’d much rather she’d survived than Kate Stewart, who I still find rather two dimensional and dull. Her “death” initially impressed me for doing the unexpected and her survival annoyed me for chickening out. Danny’s fate was sad, but his last scene with Clara lacked some emotional weight due to the lack of him in the series as a whole to make us really care too much. I also really did not like the Doomsday rip off – the ghostly voice calling Clara’s name and someone unable to cross through (heck it even looked like the same bedroom as Rose!) and although honourable, I found Danny’s final sacrifice a bit naff. I did however love the final cafe scene – wonderfully performed by Peter & Clara as she shows what a good liar she has become despite saying earlier she’d never lie to him, as each of them lies for the supposed benefit of the other. The inserts of the Doctor’s fruitless trip to Gallifrey’s location is also superb. I only wish they’d held off a few more moments before the Christmas teaser broke the mood created by that poignant last scene. Finally I can’t forget Michelle Gomez’s incredibly brilliant performance as Missy. She’s superbly insane, cruel and funny too and is a great match for the 12th Doctor. I certainly hope she’s back very soon! 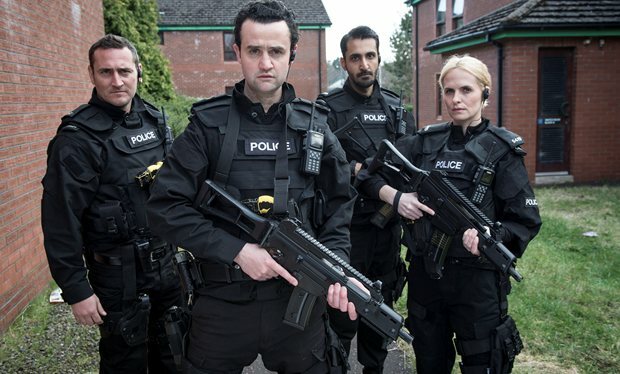 So summing up……., I’ve thoroughly enjoyed this series overall, particularly once we hit episode 4 and it seemed to find its feet. Peter is a fantastic Doctor, bringing a fresh slant to New Who that is exciting to watch, as the Doctor comes across as slightly colder, until moments of genuine affection shine through. Although a couple of stories have bored me a bit, the standard of the episodes as a whole have been above average, with some of my favourites since 2005. 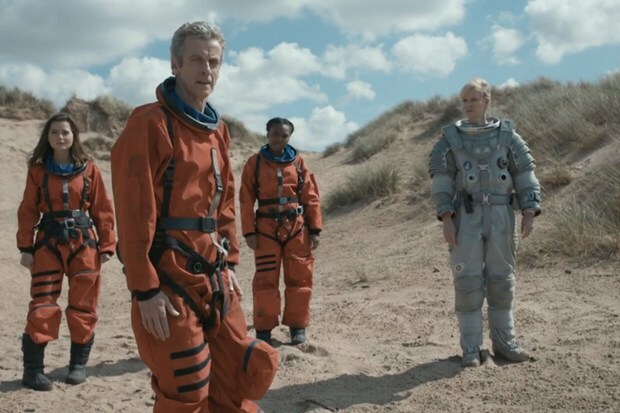 Series 4 remains my favourite, but series 8 is in my view the strongest since Steven Moffat became show runner, with decent stories as well as a great actor who is a joy to watch. 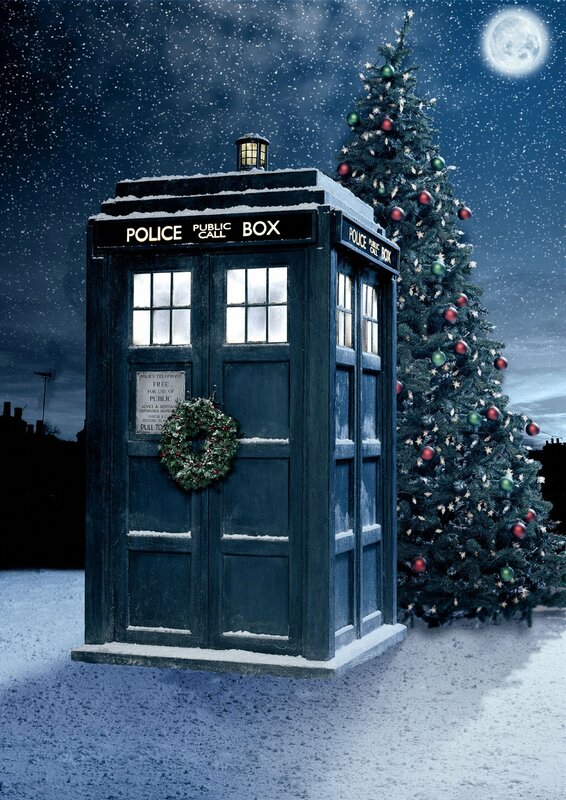 Roll on Christmas as we see whether outstanding questions are answered – is this the end for Clara and the Doctor (I assume so)? Is Clara expecting Danny’s baby (I assume so – there’s Orson 100 years from now and a post it in her flat referencing 3 months, not to mention the Doctor saying she is a mess of chemicals)? At least we don’t have too long to wait! 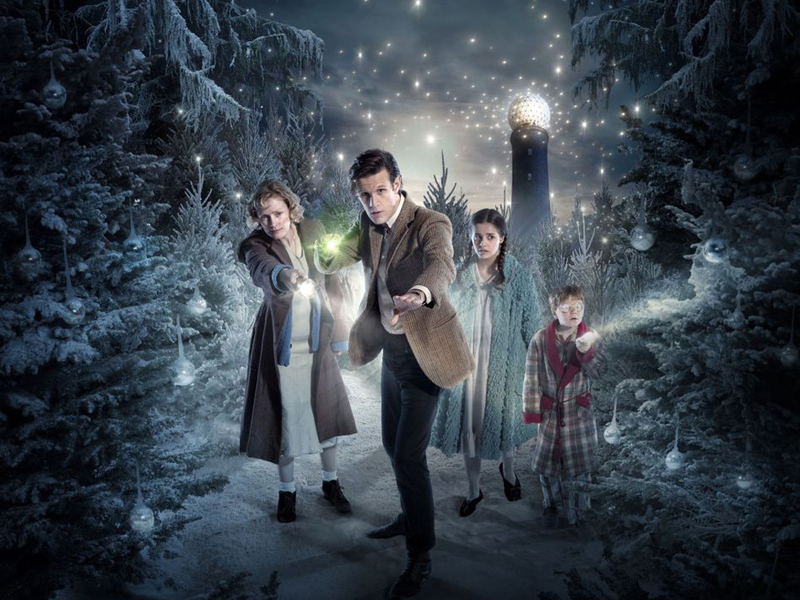 Doctor Who: The Complete Series 8 is out on DVD in the UK on 24th November 2014 and the Doctor returns as usual on Christmas Day! Posted on November 12, 2014 November 13, 2014 Categories Doctor Who, TelevisionTags BBC, Doctor Who, Jenna Coleman, Peter Capaldi, Television, Television review6 Comments on Television Review: Doctor Who Series 8 – My Verdict on Peter Capaldi’s first year! On Thursday I was lucky enough to have a ticket to the World Premiere screening of Deep Breath, the first episode of Doctor Who starring the new Doctor – Peter Capaldi. 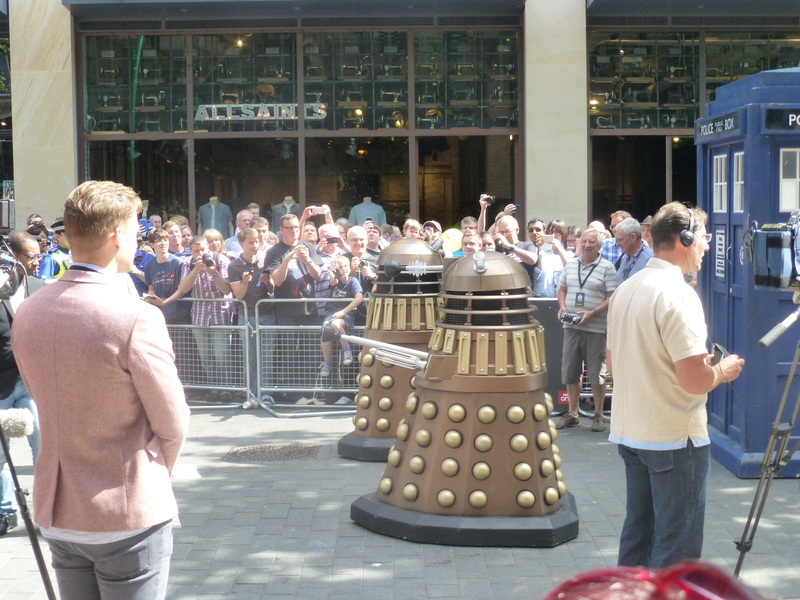 After a difficult few weeks for the Doctor Who team after various leaks, it was lovely to see so many people turn out in Cardiff City Centre to celebrate what is still such a treasured part of national television and welcome a new actor in to the role. On the announcement of Peter Capaldi as The Doctor last year I was thrilled with the choice (although, as when David Tennant left, I’d hoped for Chiwetel Ejiofor, but his recent critical success probably means this will never happen now). 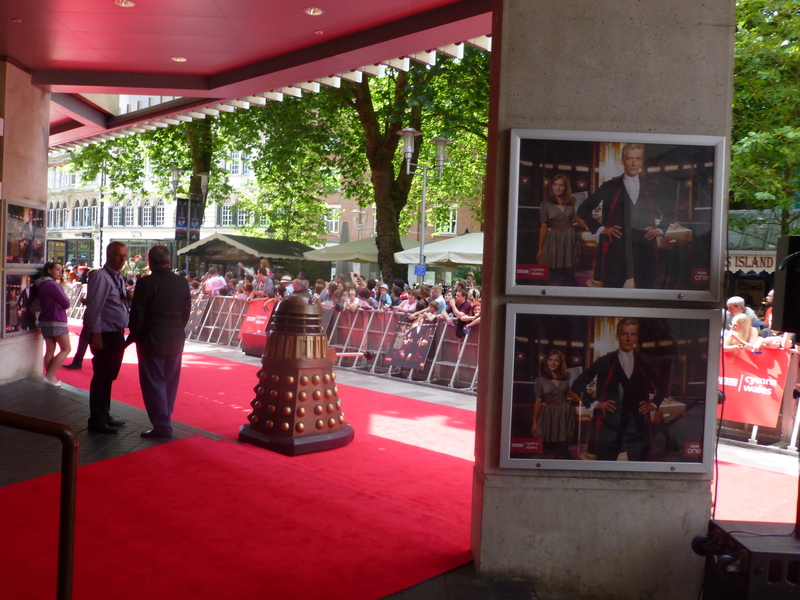 Daleks on the red carpet at St. David’s Hall in Cardiff! 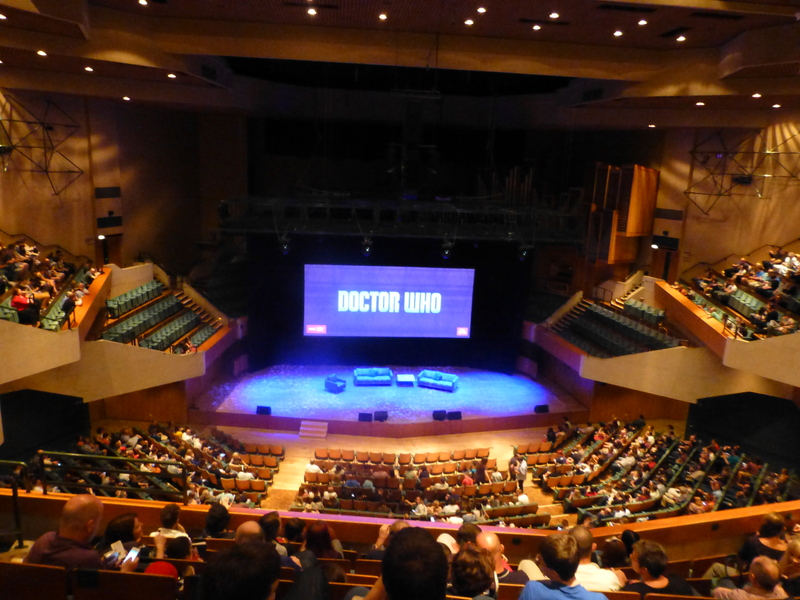 The screening was great fun, with St. David’s Hall a huge venue to screen the episode for the first time and the appearance of Peter and Jenna on stage before the start was greeted with applause and cheers. 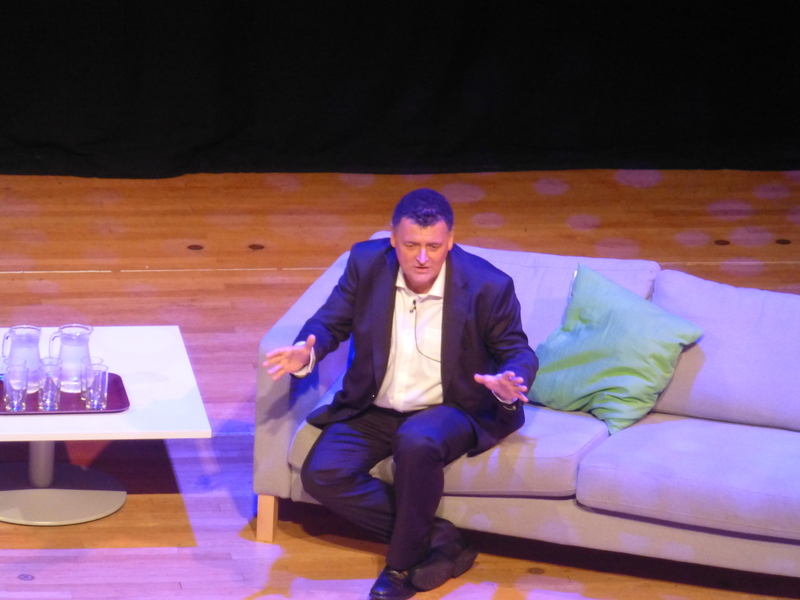 After the screening there was a Q&A with them and Steven Moffat, which had some interesting and some ridiculous questions. Peter Capaldi thinks his Doctor has been influenced by all the previous ones (he is a lifelong fan after all) and both the actors talked about how much fun they had had filming the series. Peter Capaldi was asked about his audition and he mentioned how he had no idea that he was the only person Steven was planning to audition! Jenna was asked about her favourite costume and she said the one from Asylum of the Daleks as she got to wear an egg whisk! Steven also joked about when Peter was picking his costume and he’d receive photos of him in various clothes and you could tell when he didn’t like an outfit from his face. It was clear when the right one had been found as the photo he received was Peter in full Doctor pose mode! Steven was also asked if there were any plans for a 10th Anniversary celebration for modern Who next year (which seems nuts after a 50th really doesn’t it?!). He said there were no plans, but who knows what the truth is with Mr Moffatt! 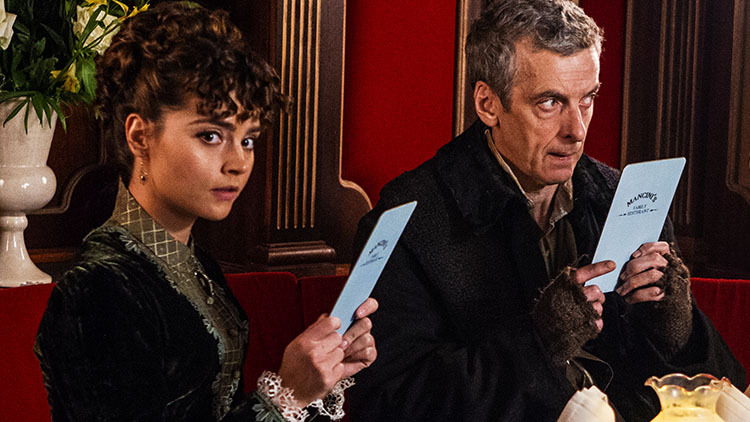 So what did I think of episode one “Deep Breath”? It isn’t a straightforward answer as there are positives and negatives. 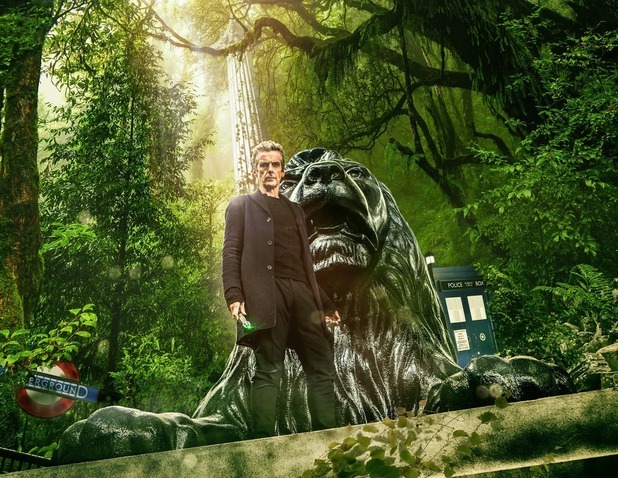 Starting with the positives – first and foremost, Peter Capaldi is a fantastic Doctor and I have no doubt he will only get better as the series develops. His Doctor is funny, with some very witty lines in this episode, but he is also darker. As when Christopher Eccleston’s Doctor rebooted the show in 2005, you are conscious that with this Doctor there is a distinctly darker man within and this will be even more evident with the 12th Doctor. 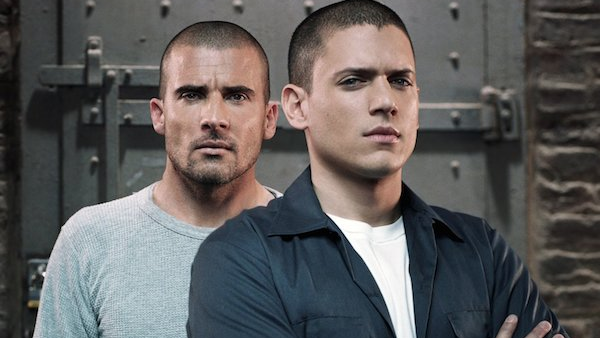 Some say this is a brave choice and perhaps it is, but I think it’s absolutely right for the show now, almost ten years after its return. I’ve enjoyed all three of the modern Doctors, but it’s time for something different and a darker Doctor is an exciting prospect. 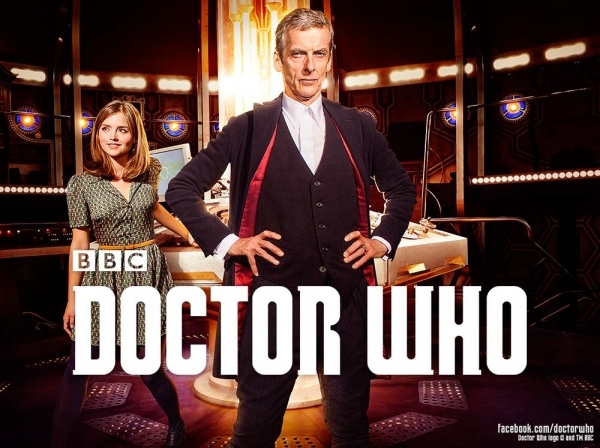 The opening episode also sees Clara dealing with a new Doctor and their relationship is re-established for a new era. I was a little irritated by her initial reaction to him – she has after all seen every Doctor and understands what regeneration means, so her attitude felt a bit odd in some respects. Although, I suppose despite meeting 13 Doctors, Matt’s was “her” Doctor so perhaps this reaction is fair enough. There is some lovely development over this feature length opener of their relationship, right through to the end (which was probably my favourite bit of the whole episode). There is a new version of the theme tune and opening credits sequence, which I loved. It’s a variant on the time vortex but focuses on the cogs of time and looks lovely on screen (and interestingly people tell me it’s based on a fan’s You Tube idea)! Murray Gold’s music is great, although the Doctor’s theme didn’t leap out at me here the way Matt’s did in The Eleventh Hour. As for the story itself, this is where my negatives kick in. I won’t give much away, but for me the plot of Deep Breath is just average. 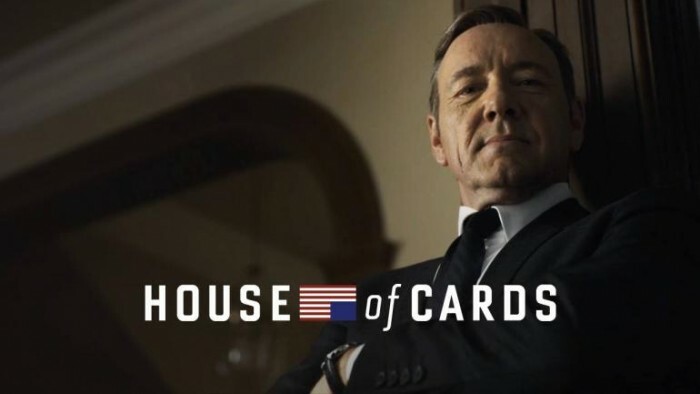 First episodes of a new series aren’t easy, but I thought the plot was a bit boring and not very original. 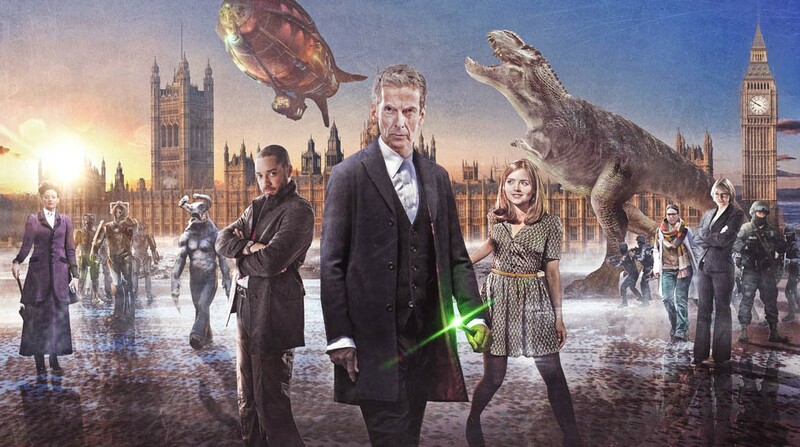 Beginning with a dinosaur in the heart of London, we see the Doctor, Clara and the Paternoster Gang encounter an eerie half-faced villain, who is using those around him for his own disturbing purpose. The most frustrating aspect for me is the episode’s use of elements from an earlier stand-alone story, which will be obvious to fans. There is even a couple of references to this other story by the Doctor. For me, this didn’t alter the fact it’s partly an old idea and referencing that, although amusing, didn’t make it less annoying. I want new ideas for this Doctor, not variants on old ones. In our seats for the screening! I’m also not a fan of the Paternoster Gang of Madame Vastra, Jenny and Strax. 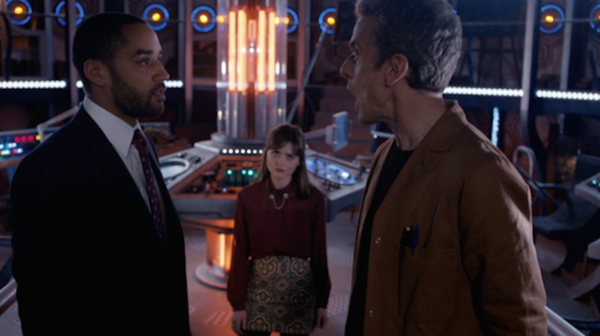 They still feel more CBBC than Doctor Who to me and their inclusion results in repetitive dialogue and plot points. We are reminded about ten times that Vastra and Jenny are married. We get it – one reminder is enough and the constant mixing genders, war-like talk of Strax feels a bit dull at this point. I know lots of people like them but I’m not one of them. 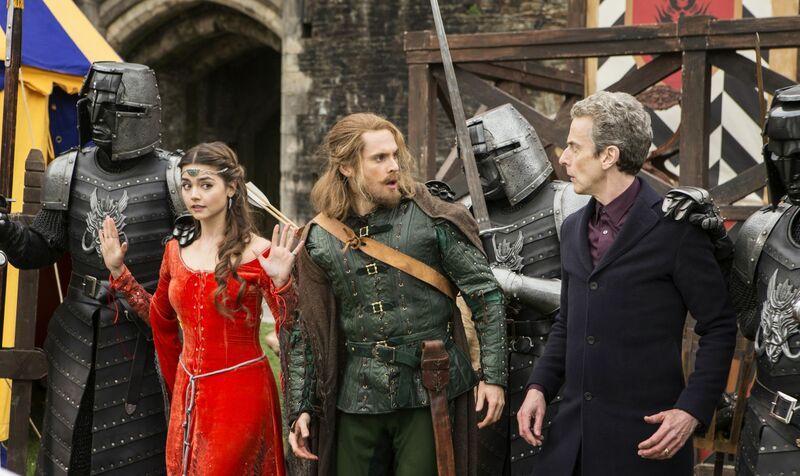 There are some fun moments and lines with them here (Vastra being Scottish gets a good scene for example), but overall I hope they pop up less this year. There are also some odd choices – the dinosaur has a purpose but it’s a bit needless. I also didn’t like how villain’s story was resolved and I couldn’t help wondering what the point of it all had been. It seemed a bit too easy to me. Although, this does include a great sequence, which is quite different for the show and will no doubt have people debating for weeks to come and I’ll be interested to see what sides people take on that debate. The episode does have an emotional base and that’s the Doctor and Clara’s relationship – what it was, what it is and where it’s going. I’ve always liked Doctor Who when it cares about character relationships (something I still think RTD was more skilled at than Mr Moffatt) and it was lovely to see some truly emotional moments between them. They are after all the heart of the show and the last few scenes are genuinely lovely to watch. So there’s my attempt to write a review without giving too much away. For me, the episode’s plot is average, building too much on ideas already used to better effect in an stronger earlier episode. There is also some weak dialogue, particularly from Jenny (“It’s the TARDIS, do you think it’s the Doctor?” – well who else would it be was my response). 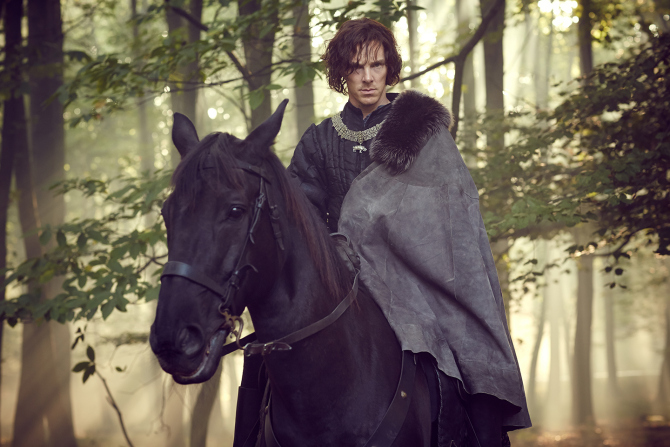 The episode also did not need to be as long as it is and could be better if some bits were cut down. However, as expected, Peter Capaldi is superb – he may be older, but that only adds to the image of a Doctor who makes you feel a little uneasy and who you sense you do not want to make angry. A mix of humour and darkness is an enticing prospect and I’m looking forward to seeing what awaits in the rest of this series and beyond (first up appears to be Daleks in episode two). 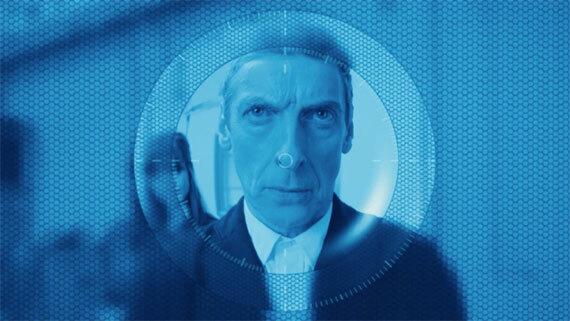 Welcome aboard Mr Capaldi – all of time and space awaits!